Mixing entertainment and education, Reversed is the first-ever diabetes realty TV show. A cross between The Biggest Loser and Survivor, Reversed was created by celebrity chef Charles Mattocks. The documentary-style show features five people with Type 1 or Type 2 diabetes who live on an island for 10 days to learn and adopt a new lifestyle and “improve their well-being inside and out.” In its second season on Discovery Channel, Reversed is more than entertaining reality TV – it’s a show with a mission to help people change their outlook on life. Watch a preview: vimeo.com/213796755. “I love making this recipe when I go home for the holidays,” says chef Mattocks. Read more about chef Charles Mattocks here. 1. Rinse the salt off the salt cod, and then soak it for 1 hour in hot water. 2. Drain the salt cod and soak it for another hour in fresh hot water. 3. Heat the oil in a skillet, add the garlic paste and sauté for 30 seconds. 4. Add the thyme and sauté for 30 seconds more. Add the onions, scallions, bell peppers, and Scotch bonnet chili, reduce the heat and cook for 5 minutes. 5. Drain the salt cod and flake it into the skillet. 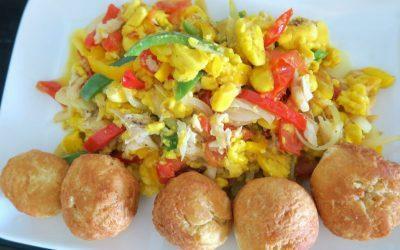 Cook for 5 minutes more, then add the ackee and cook for another 2 minutes. 6. Add the black pepper, and then remove the skillet from the heat and sprinkle the paprika over the top of the ackee and salt fish. Recipe courtesy of chef Charles Mattocks.